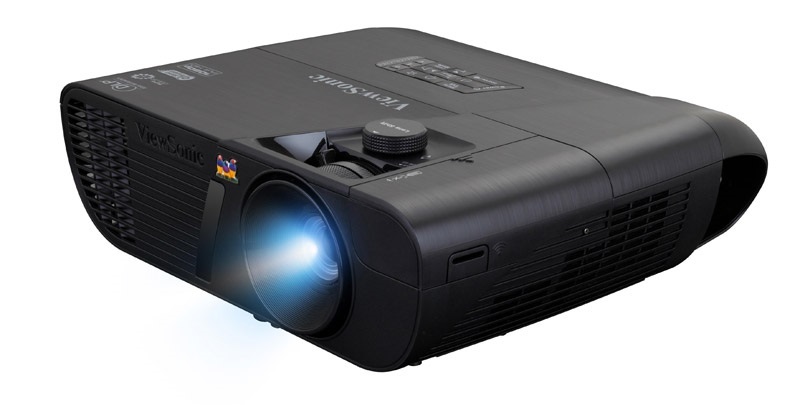 ViewSonic just introduced the Pro7827HD as newest addition to its LightStream entertainment projector family. The ViewSonic Pro7827HD is the first in the LightStream line to feature a RGBRGB 6-segment colour wheel, powered by ViewSonic’s SuperColour technology providing detailed pictures and brilliant colour gradient coverage. SonicExpert, ViewSonic’s proprietary sound enhancement technology, powers a 10W speaker to deliver incredibly clear and audible sound. Along with ISF certification for colour optimization and five viewing modes, 2200 lumens, and vertical lens shift, the Pro7827HD can create a cinematic experience in any home. Equipped with ViewSonic’s SuperColour technology, the Pro7827HD earns best-in-class colour performance honors. 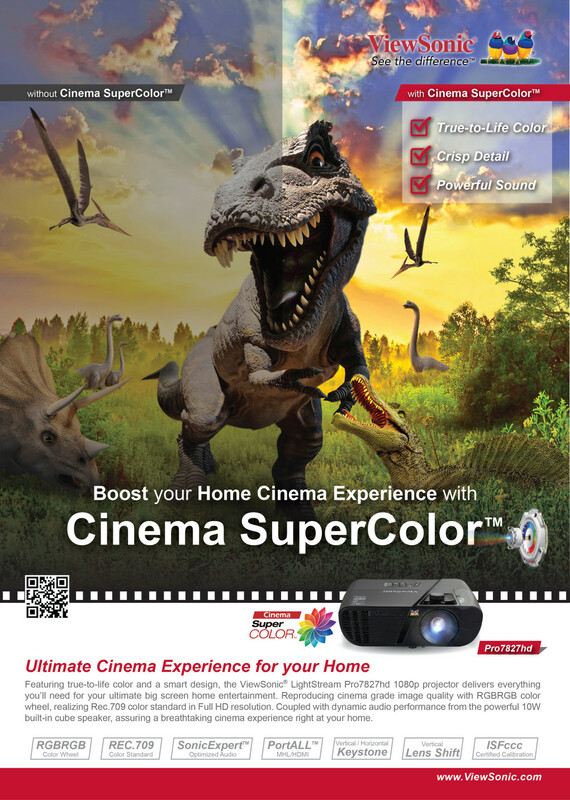 The Cinema SuperColour RGBRGB Colour Wheel adopts a special coating which filters segmental spectrums of RGB, to intensify Red, Blue, and Green colours. It fulfils sRGB and Rec.709 standards, and features pure colours to increase visual performance, especially for Blu-ray DVDs. It also focuses on Hue and Saturation enhancement, highlighting breath-taking images like sunrises, sunsets, or blue skies with intense colour gradients, while other projectors can only partially cover these complex colour gradients. The Pro7827HD is equipped with TI DarkChip3 technology to deliver excellent colours, while Full HD 1920x1080 (1080p) native resolution with 2,200 lumens of brightness and a 22,000:1 contrast ratio produce astonishing, razor-sharp image quality. DLP display technology combines accurate, long lasting colour with high native contrast ratios. In particular, DLP utilizes “True Black”, which improves projection accuracy, creating razor-sharp images for cinema, unlike other well-known technology projectors that use dark grey instead of “True Black” because of limited technology. DarkChip3 DMD is designed for high-definition video rendering to enhance contrast levels, creating extreme blacks and brilliant whites on the projected screen. Designed with sRGB/Rec.709 cinematic colours, ISF certified day and night modes, as well as a unique movie mode, the Pro7827HD delivers optimized colour for a true cinema experience. ISF (Imaging Science Research Lab) Certified for customized colour calibration, this projector provides the calibration tools to allow ISF-certified technicians to provide on-site tuning of Day and Night modes. The customized fine-tuned mechanism will become the default option to fit each user’s scenario requirement in bright and dark environments. Following a ground-breaking proprietary speaker transducer and chamber re-design, the Pro7827HD powers a 10W speaker to deliver incredibly clear and audible sound for presentations or off the clockhome entertainment. The compact speaker takes pride in quality sound with best-fit Sound Response Curve, and high efficiency of transferring electric power to sound power. The exclusive SonicMode sound settings deliver optimized audio performance for presentations, video clips and music. The Pro7827HD also features a hidden HDMI/MHL connector with 5V USB power, which is perfect for media streaming dongles including Google Chromecast, Amazon Fire TV, Roku Streaming Stick and ViewSonic ViewSync. With a shorter throw ratio, vertical lens shift, 1.3x optical zoom, smart design, and extensive connectivity, the Pro7827HD provides flexible and quick set-up in any home.